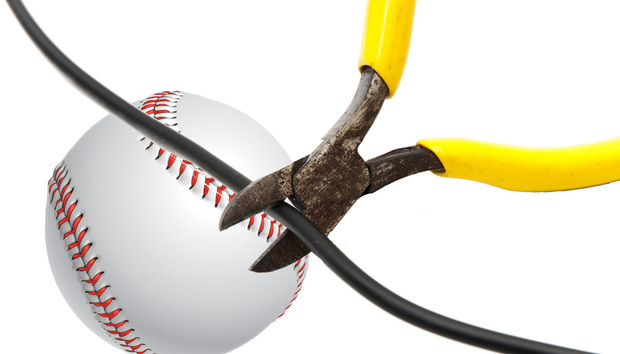 Major League Baseball has placed more hurdles in front of cord cutters than any of the four professional sports leagues. It has made baseball broadcasts the exclusive province of cable/satellite networks, even for your local teams. Add to that the league’s draconian blackout policies, and the prospect of watching the Grand Old Game without a pricey TV subscription seems as reachable as a Clayton Kershaw slider. It doesn’t get much easier come October. This year's postseason games will air nationally across five networks: Fox, Fox Sports 1 (FS1), ESPN, TBS, and Major League Baseball Network (MLBN); all but the first are cable/satellite channels you can't tune into with a TV antenna. Fortunately, with some combination of over-the-air and over-the-top options, you can still watch virtually every at-bat from the Wild Card round to the World Series. Here’s how. Of all the channels carrying postseason games, Fox is the only one available over the air. The good news is Fox is the exclusive broadcaster of the World Series, so you’ll only need an antenna to see the American League and National League champs battle for the Commissioner’s Trophy. You’ll also be able watch some NLCS games, which will be split among Fox, FS1 and MLBN. You can watch the World Series on Fox with just an antenna, provided your TV has a tuner (some recent Vizio models don't). Ready to cut the cord? Read our guide to the best indoor TV antennas. The bad news for cord-cutters is that you won’t be able watch anything else without subscribing to one of the options that follow. If you already have an antenna that can pull in a Fox affiliate, you can add ESPN and TBS to your channel lineup by subscribing to Sling Orange—Sling’s base package—for $20 a month. That will get you the AL Wild Card game, which airs on ESPN, and the entirety of the ALDS and ALCS, carried exclusively by TBS. A Sling TV subscription is your best option for streaming almost every game of baseball’s postseason. That still doesn’t cover you for any NLCS games that air on FS1, but SlingTV recently added FS1 (and local Fox affiliates in select markets) to its offerings. To get it, just upgrade to the Sling Blue package for $5 more per month. If you don’t have cable, this is definitely your best option, as it will bring you the entire MLB postseason from the first pitch to the last out, minus the handful of games that air on the cable-only MLB Network. If you’re hesitant to add a streaming subscription to your budget just for the privilege of watching postseason baseball, remember that with a Sling TV package you get access to many other popular cable channels including CNN, HGTV, and Comedy Central. There’s no contract, so you can cancel as soon as the World Series ends, though you might find you don’t want to. Sling TV also offers a free seven-day trial, so you can essentially watch the first week of postseason play without spending a dime. If you own a PlayStation console, a Roku device, or one of Amazon's Fire TV products, you have an additional option for streaming postseason games: PlayStation Vue. This streaming-TV service offers many of the same channels as Sling TV. You can read our complete guide to PlayStation Vue here. Playstation Vue offers channel packages similar to Sling TV but at a slightly higher price. Playstation Vue’s basic Access package will get you ESPN, TBS, Fox, and FS1 for $40 a month. That’s $15 more than the comparable Sling TV package, but it also includes more than 60 channels to Sling Blue’s 40 plus. On the other hand, Sling TV allows you to stream to more devices, including Apple TV, Xbox One, Windows, and MacOS. If you’re an MLB.TV subscriber, you already have streaming access to postseason games—sort of. Although Major League Baseball’s subscription service delivers live streams of every regular season out-of-market game, the league’s blackout policies prevent it from live-streaming the playoffs and the World Series anywhere in the U.S. or Canada. Instead, archived streams of postseason games are available to subscribers in blacked-out areas about 90-minutes after the game’s conclusion. MLB.TV subscribers can stream postseason games on-demand, but only 90 minutes after the games conclude. If you have the willpower to abide a self-imposed media blackout (no spoilers! ), it’s not a bad way to watch the October action without taking on the cost of an additional streaming subscription. Even if you’re not a currently a subscriber, it might be worth signing up as it’s the least expensive way to catch the postseason: as of now, MLB is offering subscriptions for $3.99 for the rest of the year. Although MLB hasn’t yet said if it will offer Postseason.TV this year, in the past this was another option for cord-cutters to catch the October action. Unlike MLB.TV, this postseason-only service offered live game feeds without blackout restrictions. But it's typically only offered some of the games—last year it was only the NL playoff games—and not the TV broadcast feeds, but rather alternate angle feeds similar to what TNT Overtime offers for the NBA playoffs. The service offered 8 to 10 different angles without broadcaster commentary, in-game interviews, and other enhancements. Subscribers could pick up to four games to watch at one time in a mosaic mode. Postseason.TV has never really been a substitute for TV broadcasts, but it was affordable—usually around $5—so if cost is more important to you than content, it’s worth keeping an eye out for it. Major League Baseball continues to be stingy with live streaming. But hopefully as the NFL and NBA continue expanding their online viewing options, the league will rethink its policies in upcoming seasons. Until then, you can take advantage of these cable alternatives, and along with our guide to second-screen baseball apps, create your own Diamond Club from which to watch baseball’s 10 best teams slug it out to the Fall Classic.